Windows tablets are finally coming good in 2015, whereas Apple's new iPad Pro isn't having the impact the company hoped for – and this could lead to a situation where Microsoft slates are almost as popular as Apple tablets as this decade closes. It's hard to believe that when you think that it wasn't all that long ago when Apple totally dominated the tablet arena, but it's clear that Windows slates are definitely gathering momentum according to the latest report from Strategy Analytics. The number crunchers reckon that, in the first nine months of this year, Windows tablet shipments have increased almost 60% compared to 2014, and they are expected to reach a total of 22 million units at the end of 2015. That will give Microsoft's Windows a 10% share of the global tablet market, compared to 22% for Apple and 68% for Android. Where it gets really interesting is the prediction for future growth, with the Strategy Analytics bean counters reckoning that Windows tablet shipments will hit 49 million units in 2019, for an 18% share of the market. Apple's share is predicted to stay pretty much stagnant at 23%, meaning Windows slates will be within shouting distance of the iPad (with budget models helping to drive Microsoft-powered devices forward). And as Forbes reports, recent studies have indicated that Apple hasn't been able to grab more share of the tablet market with its iPads, and the new iPad Pro has been suffering thanks to mixed messages coming from the company – and indeed chief executive Tim Cook. Cook himself seems to be a little confused regarding Apple's giant slate. On the one hand, he claims it's going to kill the PC stone dead – but then adds that it won't see off Mac computers, of course (perish the thought). It's not a Mac replacement, he says, yet then he shows it off tackling heavyweight productivity tasks with the keyboard cover and stylus, as Forbes notes. Of course, the thing is that Apple doesn't want to poison the Macintosh well, so has had to be very careful with its angle when marketing and pushing the iPad Pro – and that shows. The bottom line, however, is that if you're comparing the iPad Pro directly to Microsoft's Surface slates, you're comparing a tablet running a mobile operating system to one powered by a full-fat desktop OS. And that's a major difference in terms of things like multitasking and how productive you can be with a tablet plus keyboard in general. 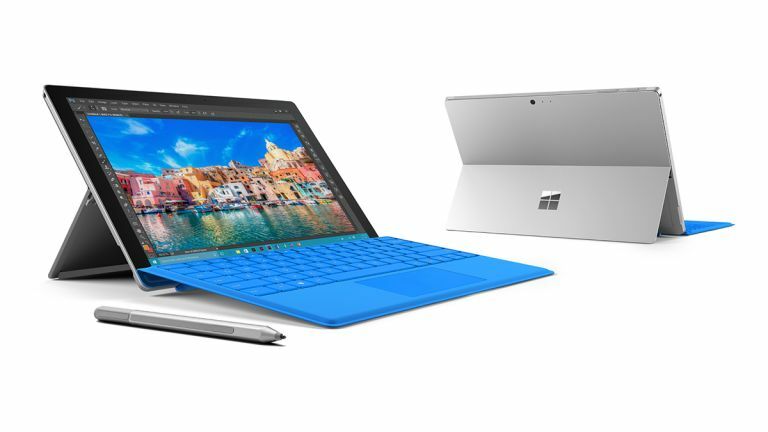 So, then – will Microsoft push forward and eventually overtake Apple in the tablet world come the early 2020s? As ever, only time will tell, but things are suddenly looking unexpectedly rosy for Redmond.